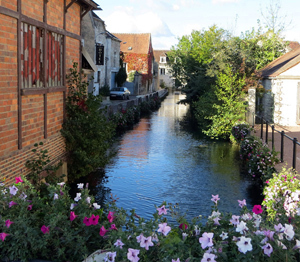 BEAUNE, France – An innovative dinner, fantastic wine-education lesson, tour of the Hospice de Beaune, and lunch at Burgundy’s most-prominent frommager’s highlighted the first full day of my group tip to Burgundy. I am leading four couples, two from Indianapolis, one from Boston, another from Illinois through five nights in Beaune and three nights in Paris June 11-19. See an album of photos from our Sunday activities. Pierre sharing his Burgundy insights. There really were so many highlights but the best might be two-and-a-half hours later Sunday afternoon with Pierre, owner of La Cave de l’Ange Gardien. Tasting with Pierre or Nicole is rated as the No.1 or 2 tourist experience in Beaune by TripAdvisor. After Sunday afternoon, I’m not sure that’s high enough rating. We were fortunate to have the charming, humorous Pierre as our guide through a Burgundy education that helped everyone better understand the web of regions within one of the world’s most famous wine areas. Pierre has us taste six whites and then six reds blindly, make notes on each and then rank them. Then he would reveal the producer, region, and cost per bottle. It was a wonderful experience. We learned so much from Pierre. It started with a few statistics including that 61 percent of the wine from Bourgogne is white wine – not the red most would expect. Village wines represent 36 percent of production, premier cru is 10.5 percent, while Grand Cru is just 1.5 percent of all Burgundy land. The rest are simple Bourgogne wines. What often confuses newcomers to Burgundy is that Grand Cru is often considered the very best wines and they often are a top choice. But the designation is for the vineyards. As Pierre explained, if a winemaker owns a Grand Cru vineyard he can still make terrible wines but it’s still a Grand Cru. There are pricer and nicer-looking places to taste than La Cave de l’Ange Gardien – but none better. Locals heartily recommend Pierre and Nicole for the most-authentic experience for learning about Burgundy. We started our day with a self-guided tour of the famous Hospice de Beaune. The Hospice, or hospital, was started in the 14th century by one of the Dukes of Burgundy Nicolas Rolin. It’s easily one of the most recognizable structures in all of France outside of Paris. The ladies in our group tasting the cheeses of Alain Hess. At noontime we stopped by Alain Hess Frommager – or cheesemaker. Hess is Burgundy’s best-known maker of all things cheese. We had a fantastic light lunch in the Vin Cave below the popular retail store. French cheeses are really remarkable fresh and run from the silk smooth triple cremes to all sort or stinky creations. We capped our evening with dinner at Le Benaton, one of Beaune’s Michelin-starred restaurants. Le Benaton is known for creative and very innovative presentation in its cuisine. It did not disappoint. The photos in the accompany album illustrate the dishes better than my words can describe. Today (Monday), our group is off to Clos Vougeot to learn more of this great wine region’s history. There, we’ll see Burgundy’s largest walled vineyard. We’ll visit two wineries and have another innovative lunch in the village of Vosne-Romanee. Tomorrow (Tuesday), we’re off to Chablis.